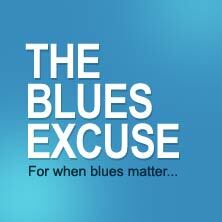 To become a true Blues Excuse tragic, you should begin by studying our background information About The Band and casting your eyes over a small photo gallery that we've prepared for the press, fans and identification parades. Once you've absorbed this, you can then move on to consulting our handy checklist to tell if you're really living a Blues Way Of Life (or just having yourself on) and then ponder Noel's world famous Beer Theories (now rated #2 or #3 by Google). These should really whet your appetite to find out more about Terre Rouge, our brand new CD or to look over our handy booking information if you'd like to book us (and by now you really, really do, don't you?). We hope you like our site and you're very welcome to email us if you do. It adds up to very good mojo for all concerned. That's right, mama! We'll be heading up north again for this tasty festival over 16-18 February. We've scored a morning spot on the Saturday and Sunday, but we'll be super keen to check out all the other artists laying down their tunes throughout the festival. Agnes is near 1770 on the lovely Coral Coast region of Queensland. OK, we weren't very good at advertising this ahead of the event, and sorry, but we laid down a boogie track to a slippery-hip soiree a few weeks ago at Fairymead House in Bundy and IT WAS SUBLIME. We all entered transcendence of the 12-bar variety. Musos, diners, drinkers, clinkers and wait staff. What is it about Bundaberg that makes it punch way above its weight in putting on cool events? We don't know, but we were smoked about playing on the old verandah of the old house in the old Botanic Gardens to people to understood groove real well. Super gig and top shelf punters. Next morning, we tucked in to a post-gig brex at Indulge Cafe in Bourbong Street. Lord. There are some Deep South dishes on the menu that would do the McIllhenny company very proud. Stop in at once at eat there. Thanks to Bundaberg Winterfeast. Stunning food, wine and entertainment. It's with a great deal of sorrow that we acknowledge the long-dreaded passing of the great BB King. For many of us in the blues world, BB King was two things. First, he was the the last surviving "big name" link that we had with the real old stuff - the cotton field holler songs and the busted old black folks that first launched this astonishing body of music on a grateful world. BB King knew all that history, and lived some of it, and emerged from it as one of the most polished performers the world has ever seen. This is like the passing of the last veteran of a world-changing conflict. Second, he was simply a wicked guitar player who really understood that music is as much about what is NOT played, than what IS played. When BB King played, every note counted. We will all miss you, Riley King, though you've definitely earned your rest. You gave us more joy than you could ever imagine. RIP, blues man. We've been, ahem, a little quiet over the past year. Sorry about that. Our drummer, the wickedly talented and evenly-tempered David Nugent, finally went to war with a long-standing wrist condition and lost. That was crap-ola, but finding another drummer to fill his shoes was similarly like trying to tap out a 4:4 beat to any Robert Johnson song. NOT EASY. Nonetheless, we've found Chop Lumsden who understands what the Blues Excuse does, converts it to Danish and then applies that somehow to a drum kit. It works well, and we are building up a set of brand new blues tunes guaranteed to light your swamp fire and cause mysterious stirrings in your most mysterious areas. Catch us soon. We are gigging about and you'll find out about it here, or on our new Facebook page which we have not bothered to set up yet. Golly, you people are impatient. Thank you, Dave, for so many year of gorgeous rhythm. You're an artist and a gentleman. CD available via Australia Post. So fast! 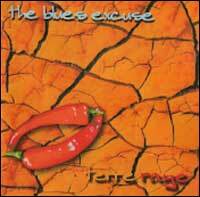 Consumer advice: The Blues Excuse cd can be procured by emailing us (somewhere on this website) and telling us you want one. This will make you feel much better than getting drunk at a gig and asking us for one and then wondering next morning what happened to your last twenty bucks last night. OK, sorry, the process is this: we're selling Terre Rouge by mail-order. You can find out how to get an autographed copy mailed to you anywhere in the world for just an extra $5 by clicking here.